Non-Hodgkin Lymphoma is treated within GWCC’s Malignant Hematology Program. Non-Hodgkin's lymphoma, also called non-Hodgkin lymphoma, is cancer that originates in your lymphatic system, the disease-fighting network spread throughout your body. In non-Hodgkin's lymphoma, tumors develop from lymphocytes — a type of white blood cell. Non-Hodgkin's lymphoma occurs when cells dividing in the lymphatic system grow at an accelerated, disorganized rate. 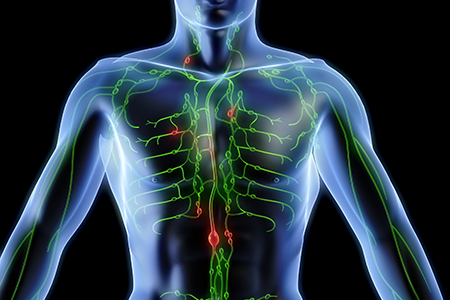 Because lymphatic vessels branch throughout the body, non-Hodgkin's lymphoma can arise anywhere and spread to organs like the liver, bone marrow and spleen. GW Cancer Center offers expertise in lymphoma that is unmatched in the region. The lymphoma leadership team has a combined 50 years’ experience studying and treating lymphoma. Our goal is to make a meaningful impact in the prevention, diagnosis, and treatment of this disease – both regionally and nationally. Through research we aim to better understand the disease so that we can offer treatments that will provide excellent outcomes to patients. We focus on areas of research that haven’t been widely studied so that we can improve our understanding of and treatments for lymphoma. Our caring specialists will help you understand and manage your lymphoma diagnosis. We work as a team to provide an accurate diagnosis and to develop the treatment plan that will be most effective. GW Cancer Center’s specialists offer second opinions for patients. We work closely with community oncologists so that patients can receive lymphoma treatments close-to-home, whenever possible. A multidisciplinary team of specialists come together to discuss every case. Patients benefit because these experts all agree upon the best treatment protocol, which may include clinical trials. Our partnership with Children’s National Health System, allows us to treat every lymphoma patient, regardless of their age. This is key for patients with primary mediastinal B-cell lymphoma, which can affect both pediatric and adult patients. We work closely with community oncologists in offering second opinions for lymphoma treatments. Whenever possible, we strive to have patients receive therapy close-to-home. The Mid-Atlantic Lymphoma Consortium brings together experts from several centers in the region. Through this network, our team stays abreast of available clinical trials that may benefit our patients. We continue to transform our own research, as well as that of others, into treatment plans. These treatments provide excellent – and advanced – outcomes for patients. Leaders from our program participate in the Scientific Advisory Board of the Lymphoma Research Foundation. They collaborate with over 50 national experts. Our participation ensures early information about and access to promising clinical trials. Our researchers focus on areas of research that haven’t been widely studied before. As a result, we can advance the understanding of lymphoma and develop new treatments. The Food and Drug Administration’s approval of CAR T-cell therapy for aggressive B-cell lymphoma is expected in the near future. When that happens, GW Cancer Center is ready to offer this promising lymphoma transplant therapy to patients in our region. Our physicians have experience treating lymphoma patients with immune deficiencies, including HIV. With the help of immunotherapy agents, we can bolster the body’s immune system to help fight lymphoma. We have expertise in treating rare or aggressive lymphomas. These include central nervous system lymphomas, mediastinal B-cell lymphoma, skin lymphoma, Mantle cell lymphoma, and Burkitt’s lymphoma. Our leading-edge laboratories help us understand the biology of lymphoma, including what impact microbes and viruses have on the disease. New technologies exist for detecting the disease at the molecular level. We use them to study minimally residual disease (MRD), which is an indicator of whether the lymphoma has or may come back. We offer sensitive liquid biopsies that provide information about how much tumor material a patient has. This is useful in the diagnosis, prognosis and treatment of patients with lymphoma.